US President Donald Trump has apologised to his new Supreme Court Justice Brett Kavanaugh for what he described as a "campaign of lies" during the confirmation hearings. He was referring to the acrimonious debate over Mr Kavanaugh's nomination, after sexual assault allegations were made against him. Mr Kavanaugh said he was not bitter despite the "contentious" confirmation. He has denied the claims made by several women. The judge was confirmed by the Senate on Saturday, in a 50-48 vote that largely followed party lines. It is seen as a major victory for President Trump, tilting the balance in the nation's highest court in favour of conservatives for years to come. One of the women accusing the judge, Prof Christine Blasey Ford, said Mr Kavanaugh sexually assaulted her at a house party in 1982 when they were high school students. She provided testimony to the Senate Judiciary Committee and Mr Trump initially called her a "compelling" witness - but he later questioned her credibility and mocked her at a rally. What did Mr Trump highlight? 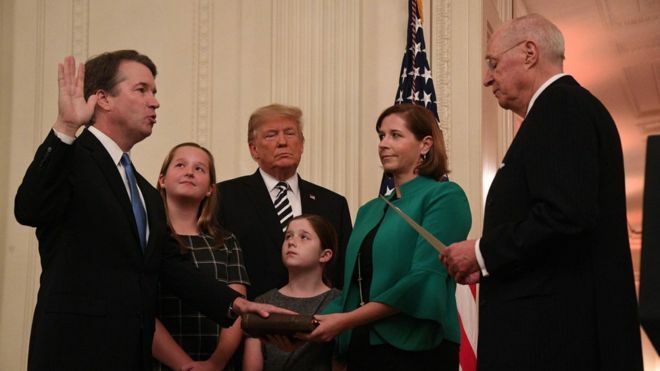 As the White House ceremony got under way on Monday, Mr Trump said: "On behalf of our nation, I want to apologise to Brett and the entire Kavanaugh family for the terrible pain and suffering you have been forced to endure." And he decried a "campaign of political and personal destruction based on lies and deception", adding that "under historic scrutiny", he had been "proven innocent". Last week, the FBI completed a report on sexual misconduct allegations against Mr Kavanaugh - but the findings have not been released to the public. Prof Ford has been unable to move back home because of "unending" death threats, according to one of her lawyers. Mr Trump says Democrats will lose in the 6 November congressional elections, which will shape the remainder of his presidency. What did Justice Kavanaugh tell the ceremony? The 53-year-old justice told the White House gathering that he would not let the "bitter" confirmation process affect his work on the highest court in the land. "The Senate confirmation process was contentious and emotional," Justice Kavanaugh said. "That process is over. My focus now is to be the best justice I can be," he added. Without mentioning the sexual assault allegations, he touted his record of promoting women - and the fact he has become the first justice to have an all-female staff. He will take his seat on Tuesday - on the far right of the bench, next to Justice Elena Kagan - hearing immigration and other cases. Who wants Mr Kavanaugh impeached? A handful of Democratic lawmakers, including congressmen Luis Gutierrez of Illinois and Ted Lieu of California, have pressed for Justice Kavanaugh's removal over the allegations. But top Democrat Nancy Pelosi has said trying to impeach the new justice "would not be my plan". A petition to impeach Justice Kavanaugh has more than 150,000 signatures. Ms Pelosi says she will file a Freedom of Information Act (FOIA) request to make public the confidential FBI investigation into the claims against Justice Kavanaugh. Justice Kavanaugh also faces more than a dozen judicial misconduct complaints over his public statements as a nominee to the Supreme Court.